The grid, a modernist icon, imposes structure onto an artwork, and accentuates the flatness of the painting’s surface. Pindell subtly challenges the grid’s supremacy in her geometric works, through accumulations of unusual materials like paper hole punches and glitter, or, as seen in this piece, by subsuming the grid within washes of color and drifting shapes. Ovals connect in a constellation that suggests molecular models or celestial bodies. 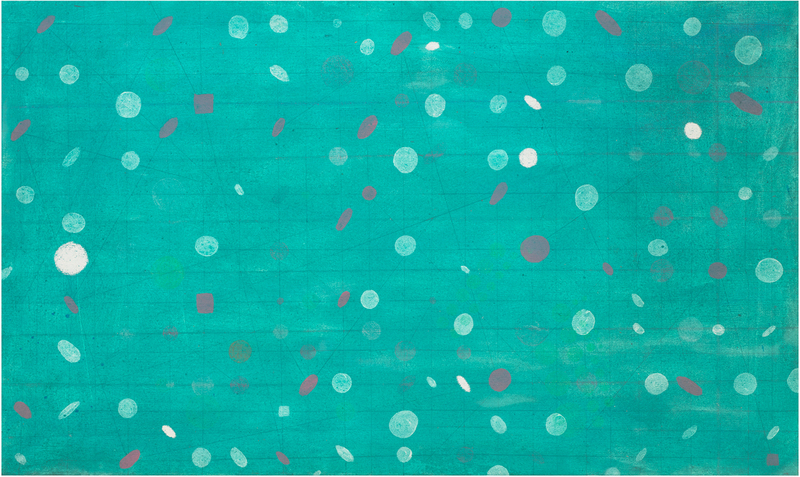 Other circular shapes swim below the bright turquoise paint, giving the painting an ambiguous depth. A graduate of Boston University and Yale, Pindell moved to New York in 1967 where she still works and teaches. Much has been written about Pindell’s expansive and varied career, as her style shifts fluidly between representational, conceptual, performative, political, and personal. While her work has always been widely exhibited, Pindell’s oeuvre has recently become the focus of renewed attention, including her recent retrospective Howardena Pindell: What Remains To Be Seen at MCA Chicago, and her inclusion in last year’s exhibition We Wanted a Revolution: Black Radical Women 1965–85 at the Brooklyn Museum. An innovative figure in contemporary American art, Pindell’s work is included in major museum collections around the world.